This exhibition features some of the worlds oldest sculptures, drawings and portraits, created across Europe between 40,000 and 10,000 years ago. To illustrate the idea that the minds of these long ago artists were not that different from our own the pieces are presented alongside modern works by Henry Moore, Mondrian and Matisse. This exhibition makes claims about “art,” about the human mind, and about the deep past, all of which are unwarranted. “Art” as it is commonly understood is meant to be seen. It is quite likely that most so-called “Ice Age Art” – especially the famous Upper Paleolithic cave “art” – was not meant to be seen at all. Most of these artefacts and images are likely to have been made for ritual purposes, as “instruments of experience.” As such, their meaning would have been in their making. They are the traces or residues of primary, magical practices, akin to shamanic ritual or ceremony. They would not have been meant for static visual display as “art” at all. A shaman could have carved into bone, and in the act of engraving contacted or released their clan’s totem, or their own power animal, as part of a healing ceremony. Once they had fulfilled their spiritual purpose, the objects may well have been discarded. The exploded ceramic figurines from Dolní Věstonice in the Czech Republic endorse this view: creation and destruction were aspects of the same ritual, and many of these ancient artefacts would not have been retained intact for possession or ownership. In this sense, as instruments of experience, they have little or nothing to do with art as we understand it today; they are tools for negotiating realms of experience beyond the ordinary and visible. After the act, cave “art” in particular may have become quickly irrelevant to nomadic, migrating populations. 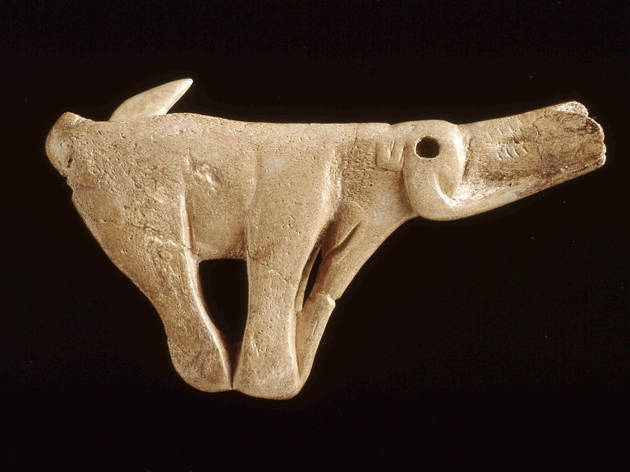 The exhibition claims to mark the “arrival of the modern mind” around 40,000 years ago. Whatever the “modern mind” is supposed to mean, complex and sophisticated behaviour arrived long before the Late Pleistocene: for well over a million years, and during earlier ice ages, our ancestors demonstrated a powerful aesthetic sense in the manufacture of the Acheulean “hand-axe” or bi-face– some of which show “a vital sense of proportion” conforming to the Golden Ratio, and indicating that they too probably fulfilled a ritualistic function, perhaps engendering or expressing a participation mystique between human maker and stone, which gave rise to their immaculate form. And the so-called “modern mind” was in evidence at Schöningen in Germany, where highly skilled craftsmen and hunters were making and using spears around 300,000 years ago, showing a capacity for complex abstract thought and planning comparable to people today long before the exhibits at the British Museum were made. This exhibition could have been a wonderful opportunity for visitors to explore without prejudice the strange otherness of the late Pleistocene ancestral mind – to move beyond boundaries of the familiar into an encounter with the vitality and imaginal reality of a more primal people from another time, for whom ‘mind’ would certainly not have been caged by concepts fixed through written language. Instead, we are told that these makers were not just "like us" but "were us". The museum executes an acquisitive move that in effect colonises the deep past on our behalf by appropriating the extraordinary giftedness of these very ancient people who were endowed with such a strange sensitivity and exquisite manual skills – and also, most likely, an ancient but profound ‘spirituality’ at the root of their so-called modernity. The possessive move is endorsed and enhanced by placing pieces of western ‘modern’ art in the same space as this collection of archaeological items from the deep past, subtly confusing and confounding totally different meanings of the word ‘modern’, viz. that of the “modern” mind which is supposed to have “arrived” around 40,000 years ago, and of ‘modern’ art which arrived in western culture about a hundred years ago. By stressing a spurious continuity between the motives of modern artists like Picasso and Brancusi and those of our Pleistocene ancestors, namely “the fundamental human desire to create works of great beauty,” the museum presents a controversial interpretation of the so-called “art” from the ice age as if it were fact. 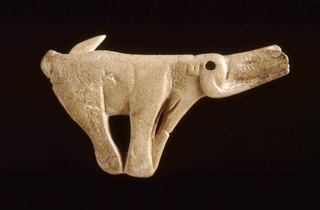 Many of the Pleistocene “artists” may well have been healers motivated, not by a desire to create beauty (which may have come naturally anyway), but by the shamanic impulse – to establish health and balance, both within the tribe, and also between the tribe and the world around them. Instead of creating a contact zone for a meeting of our minds with the powerful aura of the Pleistocene mind still retained by many of these exquisite exhibits, the museum sets out to influence visitors before their visit by establishing the identity of the makers – they were “us” – both inhabiting the “modern” mind. Use of the term “modern mind” in this exhibition is further given the stamp of approval by brain science and the perceived anatomical similarities between the late Pleistocene human brain and ours. Yet use of the term “modern mind” is not justified and the authority of neuroscience is misplaced. We are light years away from understanding mind and consciousness, despite the current reductionist dogma equating mind with brain. Mythologist Joseph Campbell once wrote: “The history of our subject, then, is of the progressive enlargement of man’s knowledge of the magnitude of his own ignorance and the expansion thereby of his wonder.” It is a shame that the British Museum’s pseudo-scientific interpretation of the Pleistocene mind should betray such profound narcissism in relation to our deep past; and its posture of supplication to contemporary neuroscience in its interpretation of our ancestors’ exquisitely fashioned artefacts is embarrassingly crude. Never got to see this one. It turns out that you need to book at least two hours in advance. This is probably due to the popularity of the exhibition. However for those that turn up mid morning to buy a ticket costing £10, to be told that you need to wait 90 mins before you can access the exhibition is crazy. I walked. We spent the money on a great lunch instead. This exhibition is simply sublime! From 40,000-10,000 years ago, this event displays artefacts that may never be in the same room again (at least not any time soon). Included are several Venuses, the incredible lion man - the first evidence of our species ability to create something non-literal -, the first instrument - a flute made from a vulture bone - , and the swimming reindeer featured in The History of the World in 100 Objects. Wonderful.